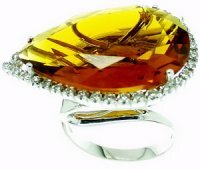 A Stunning Citrine and Diamond Dress Ring. 18k Gold. A Vibrant Citrine and Diamond cluster ring consisting of a central, horizontally set, pear shape Citrine mounted within a single row border of glistening brilliant cut diamonds. All set in 18ct White Gold. The diamonds weigh 0.35cts in total. Citrine 25x17mm.